Autumn is a great time to plant trees in the Chesapeake Bay watershed. This fall, the Alliance with partner support and volunteers put over 2,000 trees in the ground. Read more about our work by state below. The Alliance planted 14.81 acres of streamside forest buffer over six sites in Franklin, Cumberland, Lancaster, and Chester Counties this fall. The PA Department of Conservation and Natural Resources funded the buffer plantings, and each site was planted as part of the Alliance’s PA Riparian Forest Buffer Program, where landowners receive free trees and shelters, full tree establishment support, and fencing and livestock stream crossings, if necessary. 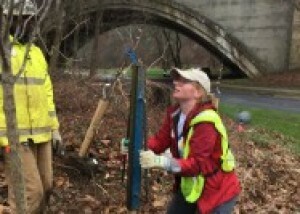 Volunteers planted five sites for a total of 162 individuals and 1,624 trees and shrubs. Three of the buffers are on municipally-owned land and are accessible to the public. We incorporated edible and floral species in large numbers to appeal to community members. It’s a truly amazing experience to see a “forest” of sheltered trees spring up thanks to the hard work of the landowner and volunteers who came out to labor in the cold mud for their communities and the environment. Family working together to stake a newly planted tree at Carter Jones Park in Richmond, VA. Credit: Parker Agelasto. In early 2018, Amy Robins the 5th District Council liaison reached out to the Virginia Office’s RiverWise Coordinator, Amy Hagerdon, to discuss the potential to collaborate on green infrastructure in Richmond public parks. Amy Robins, having previously worked at the Alliance in the Virginia office, on the Citizen Advisory Committee and the RiverWise Program, has a special appreciation and knowledge of our mission and work. 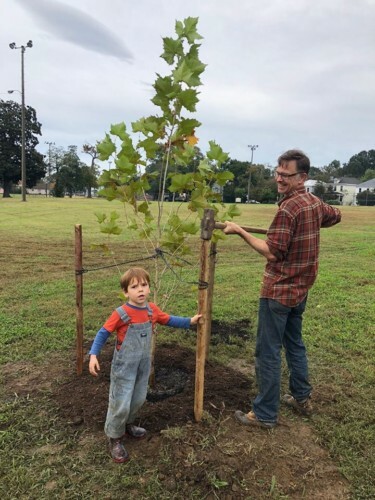 Together, the 5th District, Richmond Tree Stewards, and Richmond Parks, Recreation, and Community Facilities developed a plan to install over 60 trees in two City of Richmond parks, Canoe Run and Carter Jones. Groundwork RVA is contracted to help water the trees during the first two years of growth to increase survivorship. Thanks to our ongoing partnership with Altria, the Alliance is able to continue to respond to green infrastructure needs throughout the City of Richmond through our RiverWise Communities program. The Claymont Society in Jefferson County, West Virginia, promotes continuous education and sustainable lifestyles through an increased awareness of our environment and our connection to nature. On October 27, more than 40 volunteers shared their skills and sunny smiles to help plant 2.8 acres of riparian forest buffer, in the morning rain, along the North Fork of Bullskin Run. 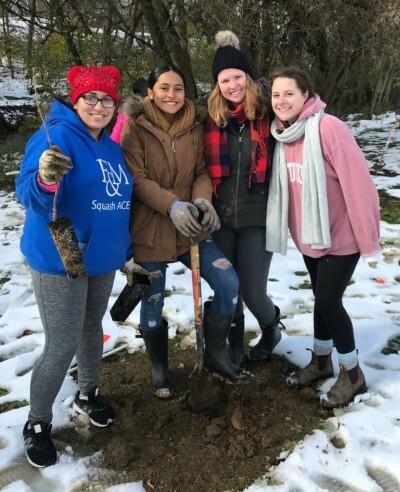 Claymont member Kit McGinnis led the charge with a deep desire to plant native trees and shrubs along the streambank to help reduce erosion, improve water quality, enhance habitat and to plant native species that would serve as an edible buffer to supplement their organic permaculture system. Herb Peddicord, WV DOF, and Holly May, the Alliance’s Watershed Forester , designed a 1.2 acre edible forest buffer, planted with walnut, red chokeberry, black elderberry, persimmon, American hazelnut, common pawpaw, serviceberry, and Chinese chestnut. Fruit trees and pecans will be planted in the spring of 2019. The remaining riparian forest buffer was planted in a mix of native trees and shrubs. Working together in a cooperative, mindful way, the volunteers ranging in age from two to eighty-two planted more than 375 containerized trees and shrubs. Fruits and Nuts, Flowers and Leaves, Bark and Roots: an edible forest buffer to support permaculture! Credit: Holly May. Jenny is the Chesapeake Forest Program Manager at the Alliance’s Virginia office, where she collaborates with the forests team on a variety of projects to advocate for the benefits of forests.